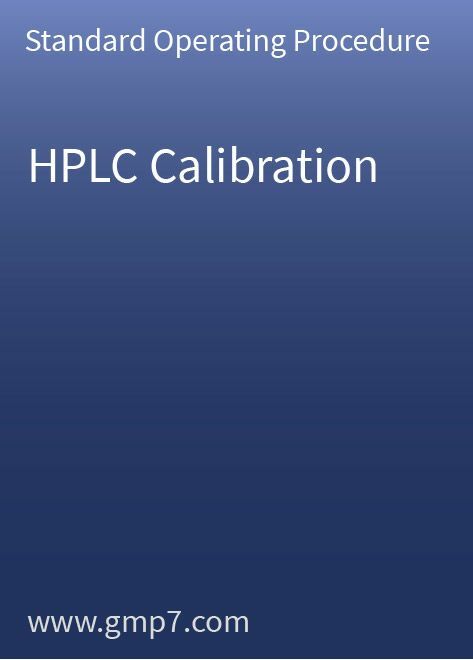 This HPLC calibration Standard Operating Procedure (SOP) describes all the individual steps necessary for calibrating a HPLC in accordance with cGMP (current good manufacturing practices). As for any calibration in the pharmaceutical environment, the calibration of the HPLC also needs to be described in a procedure and followed by the analyst in line with regulations. To avoid getting cited e.g. by the FDA with a 483 for not having documentation regarding calibration for a HPLC in the Quality control laboratories or not having acceptance criteria or the interval of calibration set prior conduct. This Standard Operating Procedure (SOP) details all the necessary individual steps involved in the HPLC calibration. All necessary documentation requirements are listed on 22 pages Standard Operating Procedure (SOP) and its corresponding 8 attachments. This SOP template is ready to use and needs only a small amount of site-specific modification. Annexure – II ® Gradient Accuracy check. Annexure – III ® Wavelength Accuracy Check. Annexure – IV ®Detector Intensity (Linearity) Check. Annexure – V ®Column oven temperature check.